Tales from a tribble: The Most Meaningless NCAA Stats Ever? The Most Meaningless NCAA Stats Ever? I know the stats don't always tell the whole story in an NCAA football game, but this is amazing and ridiculous at the same time. 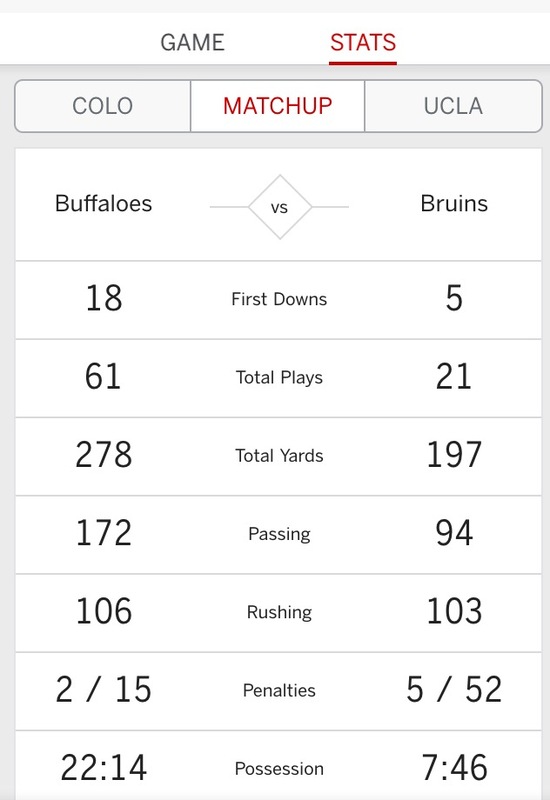 Check out these halftime stats and think if you can guess the score at halftime of this game, between the Colorado Buffaloes and the UCLA Bruins. 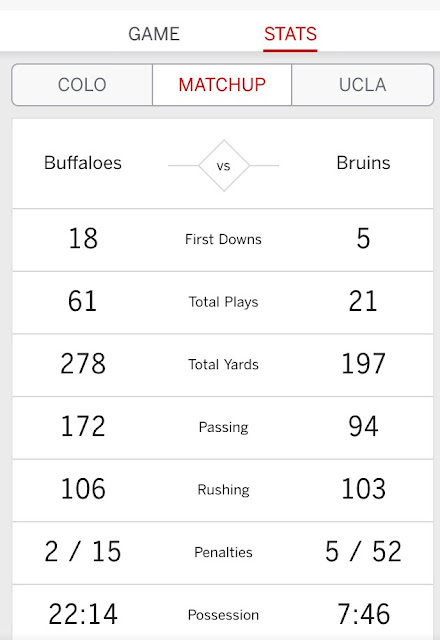 Look at this, the Buffaloes dominated every single stat by a huge margin, having possession of the ball for 22 minutes to under 8 minutes for UCLA, 61 plays to only 21 for UCLA and they out gained them by over 80 yards. So, how much do you think Colorado was beating UCLA by? They weren't beating them at all, UCLA led 21-6 at halftime. How could that be? There me be many other examples, but these are the most meaningless NCAA stats I have ever seen. Amazing, I assum turnovers told the real story? That's the thing Bradley, it was 2-2 Turnovers for the game...and I can't find out if Colorado even committed one turnover in the first half.